Today I am joining Susan at Between Naps On The Porch for the HomeGoods Mom Cave event. My home office is my sanctuary, the place where I blog, read my decorating books and magazines and work on my crafts. This is my Mom Cave. I wanted this room to be fun and girly but also functional. I have always loved black and white in decorating and for my office I threw in apple green walls to punch it up a little. The lamp is from HomeGoods and I added the trim and bows. The vintage settee was a Craigslist find and I painted it black and had it reupholstered in a black and white damask print. The mirror was a $5.00 garage sale find and I painted right over the mirror with chalkboard paint. 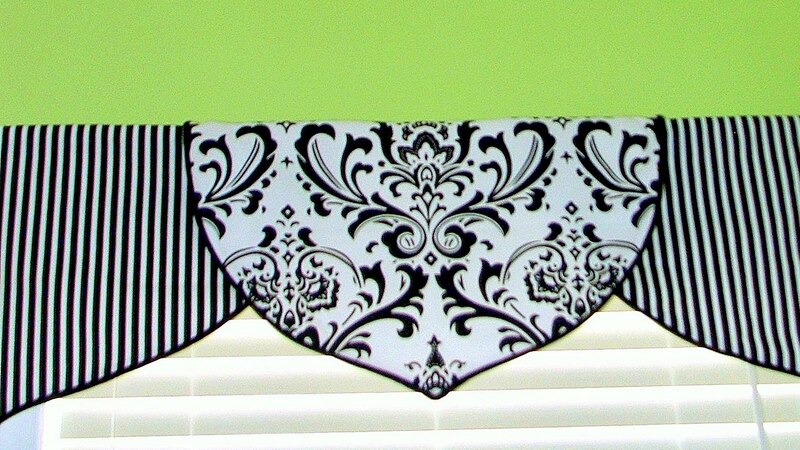 Valances custom made by a lady I found on Ebay. A before picture taken on the day the furniture arrived. If I should be lucky enough to win one of HomeGoods gift cards I would be happy say goodbye to my old generic office chair and replace it with the lovely one below. 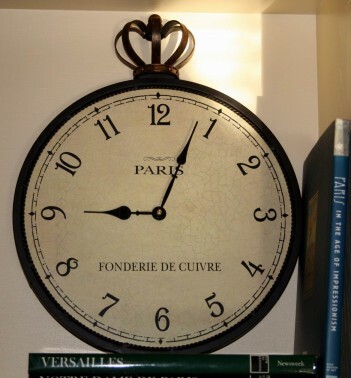 The clock was a customer find on HomeGoods website. Would this not be perfect for my room? Please drop by Between Naps On The Porch to see all the wonderful Mom Caves posted. Your mom cave is GORGEOUS!! What a gorgeous 'cave'… and soooo neat! Sherry, your mom cave is so beautiful. I love that pain colour and the black accents go perfectly with it. I can see why you would love to spend so much time in there! Hey Sherry I really like the black and white, it goes so well with that green. Good job! Hi Sherry, Love your Mom Cave. Great color with the black and white. It's all very beautiful but I have to say I love the settee best! Oh, and the welcome sign, too! I love the green walls! Also, I have that same mirror, but mine got black spray paint instead. Neat! I'm so glad you linked your office to this event Sherry. I love the apple green combined with the crispness of the black and white. LOVE that settee! The lines are fabulous! I love your Mom Cave, Sherry! Those are the colors I have in my head for my dream home office. That bookcase and its furniture line I have admired for a long time at Ballards. Love the chair you'd like to get and that clock is very neat! Sherry, I love your 'mom cave'! It should be in a magazine! Hi Sherry – your room is so very… fabulous! I wish we had a homegoods near by. I feel like I'm really missing out. I have always loved your office Sherry. Your attention to detail makes it extra pretty. You are so much fun w/ the apple green!!! i LOVE LOVE vintage settee!!! Chalk board. . . is yummie too! I love youe mom cave!!! Do you like grain sack purses? My good friend jennifer is having a giveaway. Stop by my blog and enter. If you get a chance! Take a look at my new post today.. it's about buying with a budget. You may like it. 🙂 Thanks! Sherry! The green walls really add a pop to the room. The lamp with the trim and bows is really cute. That settee is wonderful. I love it and love the damask print. Sherry, thanks so much for joining my first party!! I just fell in love with apple green thanks to you!! I love the black and white. Oh, I would so love to do that…. Sherry your Mom Cave is magnificent! We just did my girls room in a Paris themed Black/White & Green but they chose "Lime" Green instead…I sure wish they would have went with the apple green, I LOVE IT! I want to know who did your valances – it's just what I've been looking for! Gorgeous room! I am your newest follower, this is terrific! Really beautiful Sherry! I love the black and white with the green! Fabulous!!! What a beautiful room. I love black and white and the green you choose is just right. How fun to spend time in that space. Thanks for stopping by my blog ~ I've enjoyed my visit here. I just stumbled in and I think we're Sista's. My office is in the same colors and I also have an unusual settee. Too funny. You have some wonderful accents and I like your blog 🙂 I'll be back. BEAUTIFUL!!! I love you Mom Cave! I am very partial to the green walls. My Mom Cave is painted the same color. I have a mirror very similar to yours. I was going to paint it white, but didn't realize that I could paint over the mirror with chalkboard paint. What a great idea! Do you have to prime it or anything? Hi Sherry, great room and I love that valance! Your office is fabulous!! I love the green and black combination and all of your wonderful details! 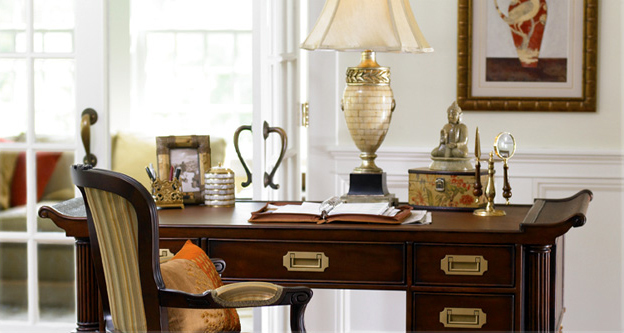 Sherry, what a cute office space! Of course, I love it being it is lime green, black & white. So cute. I think we have the same desk. Is yours from Target too? I love this desk! I have been dreaming of this color scheme but have not found the right green. WHat line is yours? What a beautiful room. This decor really takes me in as it is just my style. 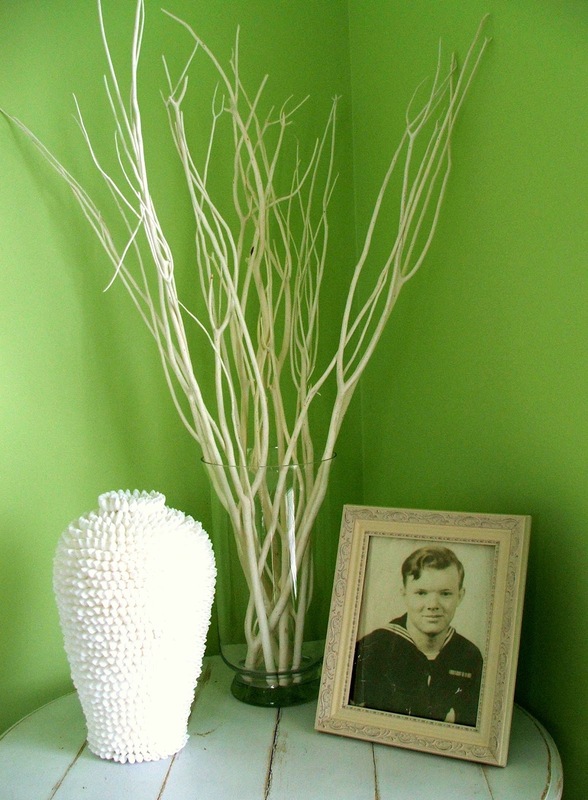 My silk floral workroom is painted this same apple green. I have some black with mine too, but there is so much floral inventory stacked high that I don't have room for many "accessories" in there. 🙂 Love this! I turn away from almost everything green, but I so LOVE this! I love everything you did and everything about it! Nice, black, white & green are one of my favorite color combinations. love the color combination of the green with the black and white. We have the same desk in our office if it is the one from Target. 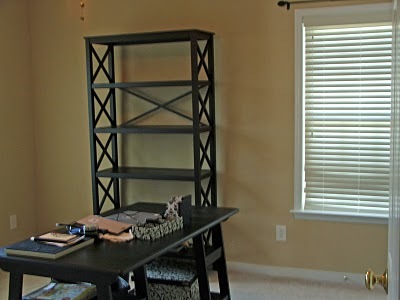 Love the bookcase too, looks like a nice place to create! 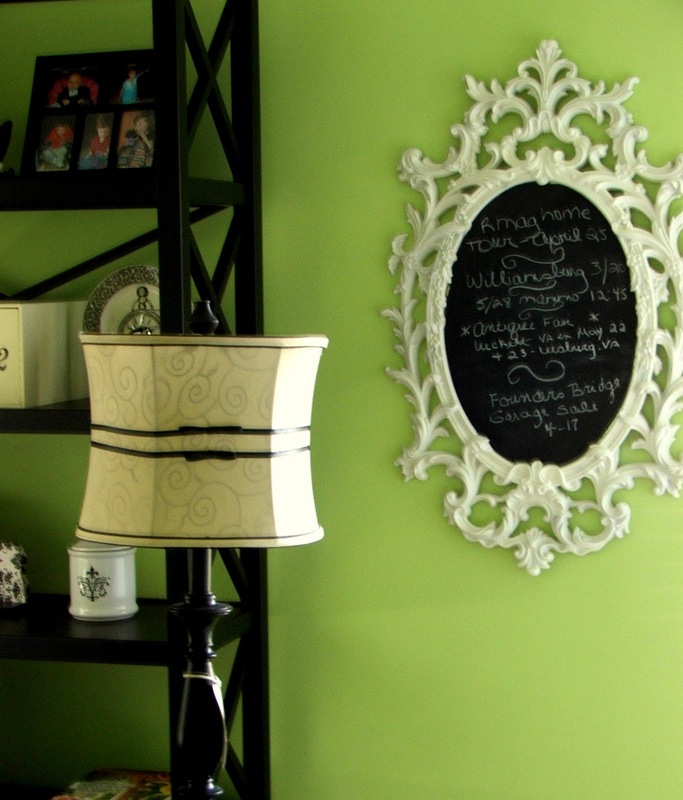 IN LOVE with your mirror..
Great office re-do…love the color choices! and great finds!! Your office is fabulous…black and green is a great color combo and you have used it to great effect here and I do love that clock, too. I love this room Sherry! The damask with the green is just gorgeous!!! I hope you are having a fabulous weekend! Sherry – I am glad I found you back! 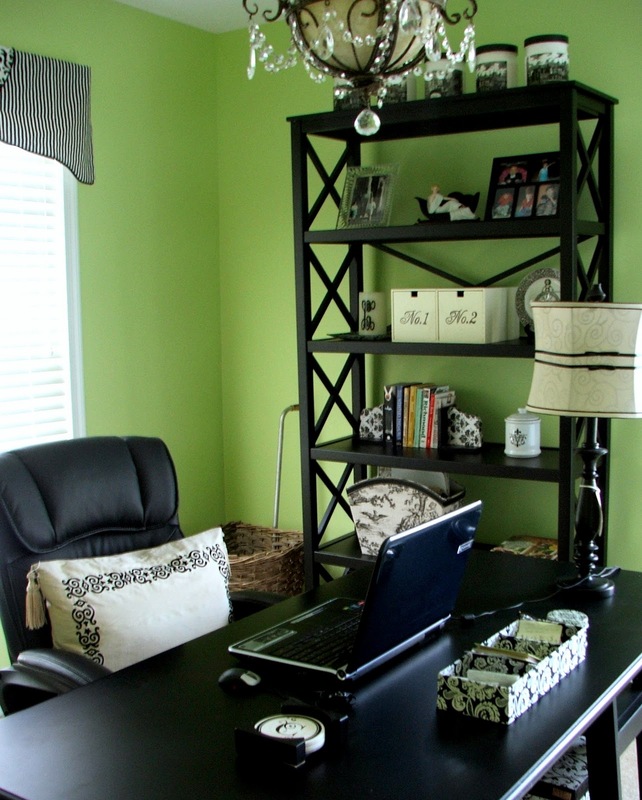 Love this room, the black and white, the desk, the green, the accessorizing on the shelf, the chandelier – all of it!! Crushing on your mom cave girl! I really love the apple green and black combo. Very nice! What a FABULOUS space! What a huge difference between the before and after photos. You made a great choice with the green wall color and love the way the damask on that beautiful vintage settee looks… you did a great job on that piece, by the way. Your chandelier is so pretty. I think I had an identical chandelier at my previous home (Lowes). I love your table vignette with the branches and the wall mirror with the chalkboard paint is just perfect… I could go on and on. Well done! Thanks for sharing. Take a look at my little corner, painted desk and desk slip covered chair. I'd love to have you follow me, hear your suggestions and tips.